Brighten the world with music! 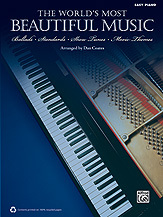 For pianists of all ages, this deluxe collection contains sheet music for 40 of the most beautiful songs ever written. Popular ballads, timeless standards, classic show tunes and graceful movie themes assure a lifetime of musical pleasure. Titles: Angel Eyes (Jim Brickman) * As Time Goes By (from Casablanca) * At Last (Etta James) * Because You Loved Me (Celine Dion) * Bewitched, Bothered and Bewildered (Cole Porter) * Bridge over Troubled Water (Simon and Garfunkel) * Canon in D (Pachelbel) * Come Rain or Come Shine * Days of Wine and Roses * Endless Love (Diana Ross and Lionel Richie) * Falling Slowly (from Once) * Hero (Mariah Carey) * Home (Michael Bublé) * How Could I Ever Know? (from The Secret Garden) * How Deep Is Your Love (Bee Gees) * How Do I Live (LeAnn Rimes) * Killing Me Softly with His Song (Roberta Flack) * La Vie en Rose (Edith Piaf) * Laura (Johnny Mercer) * Leaving on a Jet Plane (Peter, Paul, and Mary) * Love Story (Where Do I Begin) * Love Will Lead You Back (Taylor Dayne) * Misty (Johnny Mathis) * The Notebook (from The Notebook) * On the Street Where You Live (Lerner/Loewe) * Open Arms (Journey) * Over the Rainbow (Judy Garland) * People (Barbra Streisand) * The Prayer (Andrea Bocelli and Celine Dion) * The Promise (Jim Brickman) * Right Here Waiting (Richard Marx) * The Shadow of Your Smile (Mandel/Webster) * Summertime (Gershwins) * Take My Breath Away (from Top Gun) * Un-Break My Heart (Toni Braxton) * Valentine (Martina McBride and Jim Brickman) * Wind Beneath My Wings (Bette Midler) * You Light Up My Life (Debby Boone) * You Needed Me (Anne Murray) * You Raise Me Up (Josh Groban).